NARROW 2" FORGED JOHNNY JOINT® W/ 5" OF 1" RH THREAD & 9/16" X 1.6" BALL The narrow forged Johnny Joint® rod end was designed originally for use in our JK front and rear trac bars, however, it is now available seperately as a replacement part or for use in any type of universal application for custom builders. 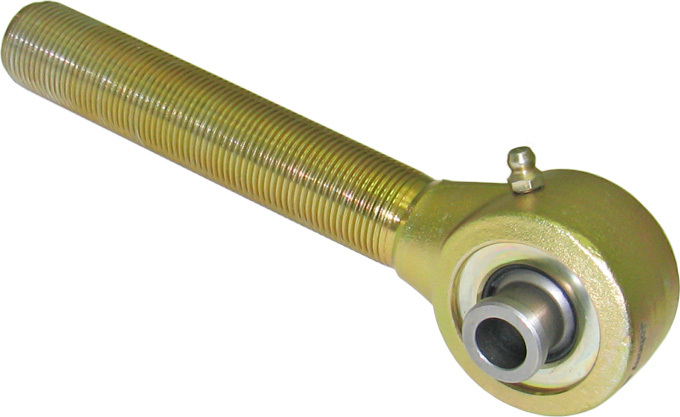 This joint is a male rod end style forging that accepts Johnny Joint® internals that are unique to this narrow joint. This version features a 9/16" thru bolt hole, a 1.6" mounting width, 5" of 1"-14 right hand threads on the shank, and is greasable through the outer shell. We also keep the jam nuts for these units on hand at all times as well - see RELATED ITEMS. Finished in gold zinc plating.